Safaris can be boring... so do something about it! Serendipitous moments are few and far between while on safari. Moreover, if you've been to Africa on numerous occasions, you become even pickier from a photography perspective (which can be disheartening for your guide, but that's another story altogether). So what's a photographer to do if he/she is in a jeep for 14 hours a day without a terrible amount of exciting moments? My advice is to look around: what looks commonplace and uninspiring may actually be quite fascinating, especially the road behind you for the landscape photographers out there. Case in point, on our first day in the crater, we saw a herd of zebras. Nothing exciting, that's for sure. But after photographing them for a few moments, our guide noticed that one was severely injured, most likely as a result of an attack by a lion. Now you can photograph this scene 100 different ways. I personally felt that a close up shot would be best suited to give context and to show "disruption". First, there is the color disruption: the red really jumps out and it cuts the picture in half. Moreover, because the photograph is framed so tightly (i.e. zoomed in), there are no distractions like trees, mountains or sky and therefore, fewer color. Second, the direction of the zebra stripes versus the direction of the injury is really striking. Again, the normal pattern is disrupted and catches your eye very quickly. 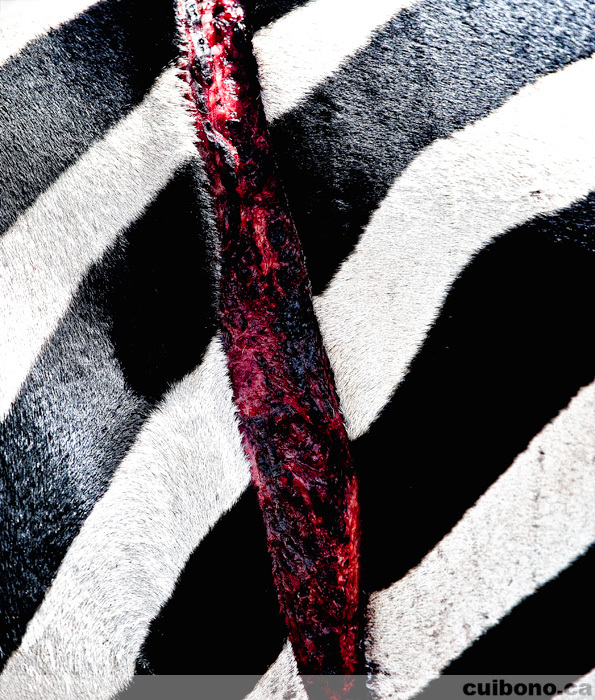 I also felt that the close up of zebra stripes and injury were enough to convey a story that you could imagine for yourselves. The picture, in my opinion, was "fully contextualized" and didn't need anything more since it would only serve to distract. So for those who are planning to go on safari for the first time, or for those who are regular visitors, if bored, take a look around. You might see something new and interesting.